Active Nonviolence is alive and well in Palestine and Israel! The interfaith delegation I co-led to this region witnessed, first hand, many Palestinians who are engaged in active nonviolent resistance to the occupation of their lands in the West Bank. Weekly nonviolent demonstrations have been held in many villages, including Bil’in, Nil’in, Al Ma’sara, Walaja, as well as in the Sheikh Jarrah neighborhood of East Jerusalem, some for more than five years. Israelis (including Combatants for Peace and Anarchists Against the Wall), and Internationals, (including Christian Peacemaker Teams, Ecumenical Accompaniment Program and Michigan Peace Teams) actively participate in these weekly actions. There is a deeply inspiring commitment by Palestinians throughout the region to keep struggling nonviolently even when Israeli soldiers shoot powerful tear-gas canisters and grenades, rubber-coated steel bullets, concussion bombs and even live ammunition at the unarmed villagers. The Israeli Supreme Court actually ruled in favor of the Palestinians, saying that the wall must be moved to be closer to the original green line, enabling the farmers to get to their fields. For two and a half years the Israeli military did not comply with that ruling, saying they could not afford to move what is actually just an electrified chainlink fence topped with concertina wire. As we approached the barricade, the Israeli soldiers launched dozens of tear gas canisters; our eyes burned and our exposed skin seared with this gas that was much more powerful and potent than anything I have ever experienced before. They also exploded concussion bombs, and the sound of the loud explosions were very frightening. Our delegation abruptly turned around and stumbled over the rocks and back down the hill to get away from the blinding tear gas which scorched our lungs and made us totally nauseated. The leaders of the weekly demonstrations are building a model of a powerful nonviolent movement which is already being replicated in other communities across the West Bank. Mohammad Khatib, secretary of the village council, says this “experimental” tactic of “nonviolent demonstrations by the grass roots is changing history,” and indeed it is! In February, 2010, after five years of nonviolent actions in Bil’in, Israeli bulldozers have finally begun to move the barrier back toward the green line. It gives the Palestinian people great hope for the possibilities in the future if they persist, nonviolently. Four miles west of Bil’in is the village of Nil’in where residents, joined by Israeli and international activists, have been staging weekly demonstrations against a nearby expansion of the Israeli West Bank barrier there. This barrier has appropriated approximately one-third of Nil’in’s land – similar to the percentage in Bil’in. On July 28, 2008, 10-year-old Ahmed Moussa was fatally shot by Israeli soldiers during one of these anti-barrier protest demonstrations. Then, on March 13, 2009, U.S. citizen Tristan Anderson, of Oakland, California was critically injured when he was struck in the head by a gas canister. 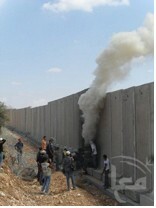 It was fired by Israeli soldiers after the weekly protest had already ended. 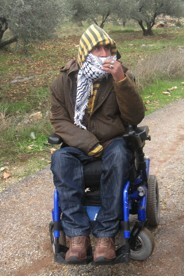 One year later he remains in an Israeli hospital near Tel Aviv, and is beginning to talk and walk with the help of a walker. Tristan’s only “weapon” was the camera he was using to take photographs of the demonstration. Other peaceful activists have been killed in these protests, and more than 11,000 Palestinians have been imprisoned for nonviolent resistance. However, the commitment of the Palestinian people to continue the struggle nonviolently is unwavering. They use an Arabic word “Al-Samoud (الصمود)” which means perseverance or steadfastness. Palestinians practice Al-Samoud daily by refusing to leave even in the face of heavy intimidation by Israeli military and armed settlers who are trying to confiscate their lands and remove them from their homes. The Palestinians are steadfast even when they can’t reach their fields, when their homes are raided in the middle of the night and members of their families are arrested, and in so many other ways. Their perseverance is an amazing model of nonviolent resistance and relentless persistence. Mahmoud Zwahre, Mayor of al-Ma’sara, Head of the al-Ma’sara Popular Committee, and a leader of the nonviolent resistance. On another Friday, we joined the demonstration in al-Ma’sara, south of Bethlehem, where approximately 200 villagers, with Israeli and international supporters, marched peacefully to the edge of town. Although there is already a large wall which separates the Palestinians from their fields, the Israeli soldiers erected a large barbed wire bulwark even closer to al-Ma’sara, as part of their ongoing acts of intimidation. In addition, behind the barbed wire fence were more than seventy-five well armed Israeli soldiers, supported by six military vehicles—all for a peaceful, nonviolent demonstration. After the rally was officially ended, people slowly began walking back down the road into al-Ma’sara. The soldiers crossed the barbed wire, and began aggressively pushing the crowd back toward their village. A couple of young boys threw small stones at the military; the soldiers immediately rushed toward them, and shot off sound grenades which exploded like a bomb. The blast was both deafening and frightening. Finally, Sami Awad, Executive Director of Holy Land Trust (HLT), spoke with the commander of the troops regarding this provocative action. Sami told him that the army’s invasion of the village could end up with a major confrontation, and their aggression certainly had nothing to do with security for the people of Israel. Once they concluded this show of force, the troops and vehicles finally retreated back out of the village, and people returned to their homes. 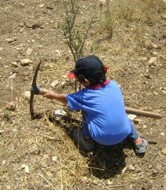 Recently, settlers raided his farm and uprooted 400 olive trees which gave his family much of their income. However, committed to a nonviolent response, Daoud and his family have planted 500 more trees, which will take many years to mature. Daoud’s family was refused building permits from the Israeli authorities for his house, for the greenhouse where they start new seedlings, and for the cistern where they collect rain water since they are not allowed to dig a well. So, at any time the soldiers could come and bulldoze his house, force him and his family to leave, and destroy their greenhouse or cistern. Daoud and his family are a remarkable example of Al-Samoud (الصمود)” – steadfastness and perseverance, or relentless persistence, in their nonviolent struggle to survive. Daoud questions, “Why can’t all the religions, all the children of Abraham, understand that the basis of all our religions and religious teachings are the same… That we love one another, that we treat others as we would like them to treat us, and that we are all children of God?” He does not seem to have an ounce of hatred toward the settlers or the Israeli soldiers who continually threaten his family with eviction from their ancestral land. Their faith that justice will prevail, and that nonviolence is a more powerful weapon than the gun, sustains them. Daoud and his family organize camps for young people of all religions, and from many countries around the world to come and live on their land. It provides a wonderful opportunity for these young civilian diplomats to learn how much we all have in common – and that we need to treat one another as we would have others treat us. When they return to their home countries, they take the message that building friendships and understanding one another are important parts of nonviolent social change. They have learned that there are other ways to challenge injustice, oppression and violence than responding with more violence. Four kilometers northwest of the city of Bethlehem, al-Walaja is another example of a community which is nonviolently resisting being evicted from their land. During the Israeli-Palestinian war in 1948, they were forced to leave their ancestral lands across the valley where they had lived for centuries. Those fields were fertile and had natural springs. While many villagers fled to refugee camps in Bethlehem and Jordan, others continued to live on the land. While their lands had been seized within Israel, they continued to live on and farm an area across the valley from their former community, on the Palestinian side of the “Green Line.” After the 1967 war, they tried to get permits from the Israeli authorities to build homes for their families, and a school, at this new location. They spent decades, and tens of thousands of dollars, unsuccessfully submitting permit applications. Finally, in deep frustration, they went ahead and built their homes without permits. The Israeli authorities have bulldozed many of these “illegal” homes, but each time the houses have been leveled, the families have rebuilt them, sometimes many times. The families in al-Walaja also wanted a school for their children, and they sought the assistance of the United Nations Relief and Works Agency (UNRWA). The UN said they could not help build a school if Israeli authorities had not granted a building permit. After several years of unsuccessfully trying to get the permit, they gathered money from the members of the al-Walaja community to build a school on their own. Several more years later, the UN finally agreed to help in providing funds for books and supplies for the school, but the Israeli authorities could still come any day with their bulldozers and completely destroy the school. Such is the state of “justice” in the West Bank. We were there on a Friday morning, and several hundred villagers, Israeli Combatants for Peace, and Internationals, had a peaceful march. The demands of the people of al-Walaja were echoes of those in so many Palestinian villages who are being encroached upon by settlers: (1) the right to continue to live on their land, (2) to live in their homes without threat of demolition, (3) that their children be able to get an education without fear of their school being leveled. In addition, the community opposes plans for the building of a 26-foot-high apartheid cement wall which could totally surround their community. A tunnel under the wall would be the only way in or out of Al-Walaja. However, this tunnel would be controlled by the Israeli soldiers, and could be opened or closed by them at will, without explanation. Although the people in al-Walaja feel threatened from all sides, their commitment to al-Samoud keeps them struggling for a peaceful future for their community. Sheikh Jarrah is a beautiful old Palestinian neighborhood in Occupied East Jerusalem. In 2001, Israeli settlers broke into a sealed section of a Palestinian family’s house and refused to leave, claiming the property was owned by Jews. Many contested evictions have occurred since that time, including one on August 2, 2009. Following an Israeli court decision, two Palestinian families (al-Hanoun and al-Ghawi), consisting of 53 persons, were evicted from their homes in Sheikh Jarrah. Jewish settlers moved into the houses immediately. These brutal house seizures by the Settlers were supported by armed Israeli soldiers and police. The Palestinians’ belongings and furniture were destroyed, and tossed out on the street, and now a community of these evicted families are living in tents on the street in front of their own homes. One Friday afternoon when we joined their regular vigil, perhaps 30 Hasidic Jewish settlers arrived in their long black coats and broad-rimmed black hats, and curls (payos) down the sides of their faces. They were honoring Shabbat, the seventh day of the Jewish week, and a day of rest in Judaism, by celebrating their brutal take-over of Palestinian homes. They were dancing the Horah, and enthusiastically singing in the street in front of the homes they had seized. There was a frenzied spirit as a large group streamed into one yard where four-fifths of the house is now occupied by Jewish settlers, with the Palestinian family living in the other fifth. A lone, elderly Palestinian woman held silent vigil in a tent in the side of the yard, while Shabbat prayers were interrupted by shouts of “Death to the Arabs,” by the Hasidic settlers. Later, they graffitied this slogan on the walls of the houses, and invaded another home, beating up two young Palestinian children who had to be taken away in ambulances. This was the tragic way they honored the Sabbath. Amazingly, despite this continual harassment and violence, we did not observe the Palestinians using any violence – in word or deed – against those who have forcibly taken their homes. For months they have lived in the street in their small tents with hope and quiet determination, or Al-Samoud (الصمود), and continue the struggle to get their homes back. Other Palestinians on the block are fearful that they will be the next victims of this violence by the settlers who are supported by the Israeli Supreme Court which has ruled that the Jews own the land. Another important part of the Palestinian Nonviolent movement is MEND (Middle East Nonviolence and Democracy) which is offering nonviolent training to hundreds of young Palestinians throughout the West Bank and East Jerusalem. Their goal is to help educate and nurture a new generation of Palestinians with a deeper understanding of nonviolence and nonviolent action. 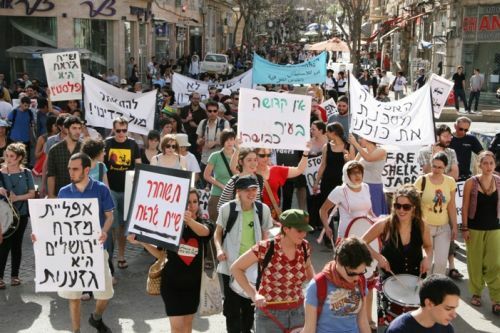 Other courageous groups of Israelis working for peace and justice include New Profile, Rabbis for Human Rights, The Israeli Committee Against House Demolitions and Women in Black who have been demonstrating every week for twenty-two years. Throughout our time in Palestine, and later in Gaza it became very clear that the security of the Palestinians and the Israelis is inextricably linked. There is such significant interdependence between these two peoples, in an ancient and Holy Land, that they must work together to find a peaceful resolution to the conflict. Peace in the region can only be achieved through nonviolence, not more rockets and bombing and killing one another. 2. Help get the word out, to our friends and the broader public, about these weekly nonviolent demonstrations and this amazing nonviolent movement in Palestine. 3. Join an Interfaith Peace Builders, or a Christian Peacemaker Teams delegation going to Israel and Palestine to meet peace and human rights workers working for a peaceful and just resolution to this tragic conflict. I encourage you to join Scott Kennedy, of the Resource Center for Nonviolence, who co-led the delegation with me in December of 2009. 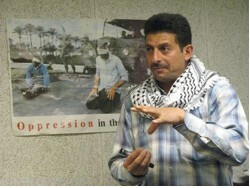 He will be co-leading an IFPB delegation October 31-November 13, 2010 during the Palestinian Olive Harvest. 7. Work to help end the American blank check to the Israeli government of over $3 billion a year in military aid to the Israeli government. It condones the continued Israeli occupation of Palestine, subsidizes the building of the Apartheid wall between Israel and the West Bank, perpetuates the Siege of Gaza, and supports the violence being used against nonviolent demonstrators in the West Bank. Please contact your Congressional representatives and the President to voice your concern. Thanks David, great reflection! You’re right about this being a hidden (by the MSM) element of the resistance. I am doing a research paper on Palestinian-Israeli conflict. Can you just make a bulletin and list the facts. Reading your 15 page article took up 20 minutes (if i skimmed i wouldn’t learn anything). This like when i make super long essays and turn them in so my teachers just skim them and give me a good grade because they’re too lazy to actually read it. Thank you for making the time to share this with us. It really shows your dedication.